In the 17th century, the "sparagoule" was first an old farm and then became respectively a grocery store, a bar, a smoke shop and finally was transformed into a family house in 1980 which was restored with the view to preserving the "provençal" caracter. What currently represents the rooms and the cottage, served before as a loft, shed, dovecote and was tastefuly renovated in 1988. The entire accommodation was constructed near the owner's house. During ypur stay, you will be amazed by theis tipical "Mas" of provence as well as by the enjoyable welcoming quality of the owner and the different human experiences that you could have with other residents met around or copious provençal breakfast. 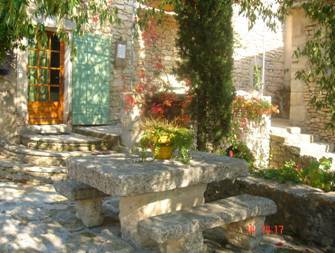 At "la sparagoule", time seems to stand still, allowing you to relax and enjoy the warmth od provençal hospitality.